Who doesn't love clouds! Fluffy, soft, you yearn to touch these bits of candy floss! Dreamy yes, so why not try painting one in watercolour! You can practice clouds. Divide the paper into fours with your painter's tape and wet the paper completely! Take a look at some clouds below. One is blank and i will do the demo on that. Meanwhile take a go. 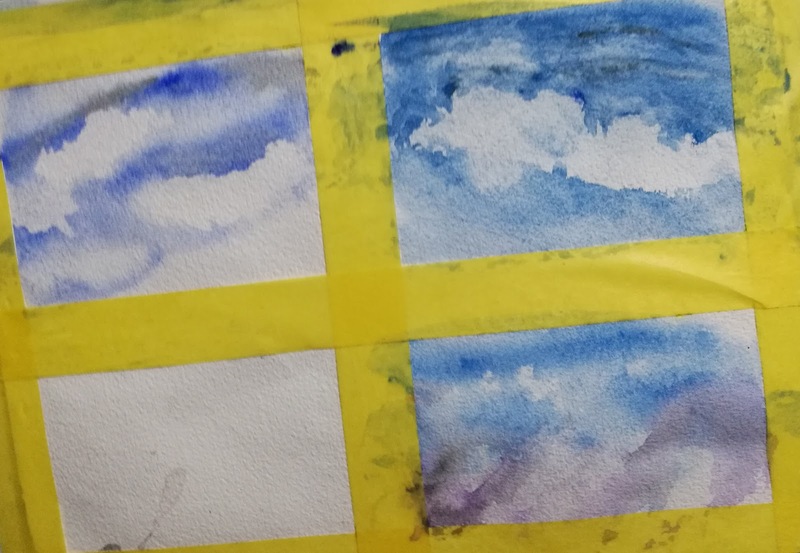 Watercolour clouds are the most fun. You never really know how it will end, often better or worse than you thought. I made some gigantic mess before i got the basics. Never give up hope. Always be positive that it's a matter of learning how to!. Practice, practice, practice is the mantra to follow! Watercolours are a passion for me. Hope you will find it as much fun. Splash in watercolours! Paint clouds step by step!